Effective Oct. 1, Deborah Watkins Bruner, RN, PhD, FAAN, will serve as Emory's senior vice president for research. Emory University President Claire E. Sterk has announced the appointment of Deborah Watkins Bruner, RN, PhD, FAAN, as the university’s senior vice president for research, effective Oct. 1. In this new executive position, Bruner will report directly to the president and serve on the President’s Leadership Team. 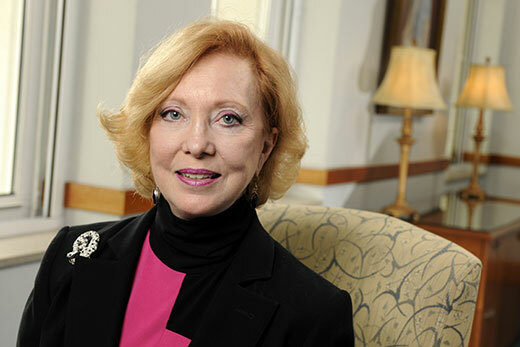 An internationally renowned researcher and clinical trials expert with a focus on patient-reported outcomes, Bruner currently serves as the Robert W. Woodruff Professor and Chair in Nursing and assistant dean for faculty mentoring at Emory’s Nell Hodgson Woodruff School of Nursing. Bruner also holds a faculty appointment in the Department of Radiation Oncology at Emory’s School of Medicine, and serves as associate director of faculty mentorship, training and education at Emory’s Winship Cancer Institute. As senior vice president for research Bruner will partner with other research leaders across Emory to identify and facilitate interdisciplinary research, including breaking down institutional and cultural barriers to encourage opportunities for collaboration through academic activities that reach across schools, colleges, centers and institutes. A critical mission of the office is to develop best practices for education, training and guidance to promote the responsible conduct of research, and to ensure compliance in all areas of research administration across Emory. Since Bruner’s arrival at Emory in 2011, she has served on a number of key Emory task forces and committees including serving as vice-chair of the Commission on the Liberal Arts (COLA), the University Senate and Faculty Council, and the Task Force on Shared Faculty Governance. In 2016 she chaired the Ad Hoc Implementation Committee of the Tenure Promotion and Appointment Committee, and currently serves as chair of the Class and Labor 2 Implementation Committee. In terms of leadership and funding, Bruner is a member of the National Academy of Medicine and was appointed by President Obama to one of only two National Institutes of Health (NIH) U.S. presidential appointed committees, on which she continues to serve. She is the first and only nurse to ever lead as principal investigator (PI) on one of the NCI Clinical Trials Cooperative Groups, first as PI of the Radiation Therapy Oncology Group (RTOG)-Community Clinical Oncology Program, and now as multi-PI of the NRG Oncology-National Clinical Oncology Research Program. NRG is a consortium of over 1,800 sites and thousands of clinical and translational investigators. Bruner’s research has been continuously funded since 1998, contributing close to $95 million as PI, and over $86 million as co-PI in funding from sponsors including the Department of Defense, National Institute of Nursing Research and National Cancer Institute. Her research funding has led to her ranking among the top five percent of all NIH-funded investigators world-wide since at least 2012, according to the Blue Ridge Institute statistics.